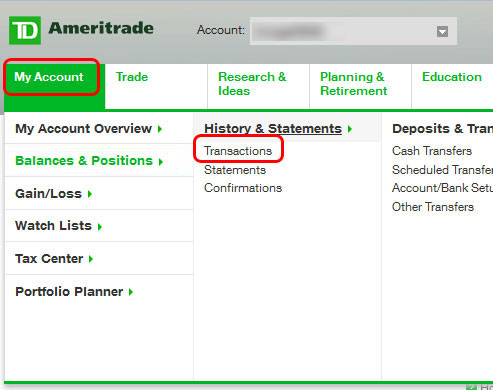 Log on to your TD Ameritrade trading account web site and click on My Account, then under History & Statements click on Transactions. 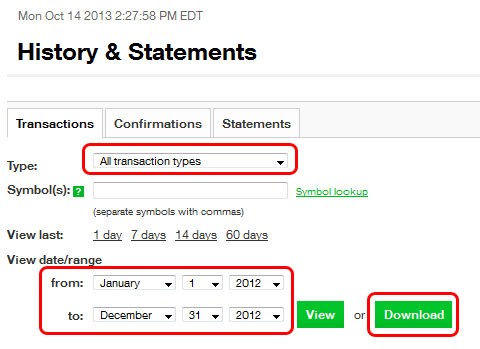 Make sure the Type is set to "All transaction types", Select a date range for the report and click the Download button. NOTE: TD Ameritrade only allows a maximum of one year of data at a time for viewing or download. Please make sure you do not have a range of more than 365 days. Please wait until a File Download box pops up. Note: If the csv file opens in your web browser, or opens in Microsoft Excel, rather than receiving a prompt to download and save, then there is likely a problem with your Windows file associations for csv files. For instructions on how to fix this click here. Click the Save button (DO NOT click the open button). you are going to save this file. - there should be an import folder under this folder). 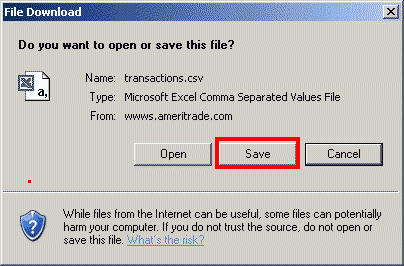 Click the Save button to save the CSV file to your hard drive. Click on the TD Ameritrade Imp speed button. A popup dialog box will ask whether you want to import using brokerConnect or Excel CSV Download. 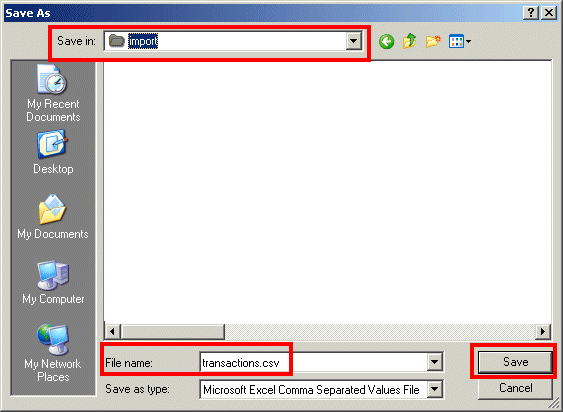 Select Excel CSV Download to import from a downloaded CSV file. Note: If you already selected a default method of importing when creating your file, this box will not appear. See: Selecting a Broker Import Filter. 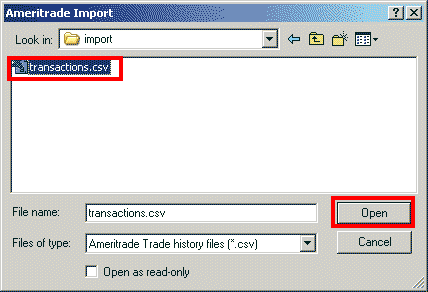 The old TD Ameritrade Account Details - Transactions report used an unusual method to indicate cancelled or corrected trades in their trade history report that makes matching and deleting them automatically upon import impossible. We are still waiting to see how the new Account History will handle cancelled and corrected trades. A buy transaction with a positive amount - a buy transaction is usually negative. A sell transaction with a negative amount - a sell transaction is usually positive. - Notice that the amount 2197.24 is positive rather than negative! - Notice that the amount -3718.93 is negative rather than positive! Please note that absolutely no other indication is given as to what these transactions really mean! Sometimes these transactions are canceling a previous buy or sell transaction, and both should be deleted before import. In other cases, these are corrected trades and should be imported. No automated set of rules exists to filter these out, so we leave the decision making process up to the user by flagging these transactions with an "X" in the TradeLog open/close column. If this transaction is canceling another buy or sell transaction and therefore both the trade marked with an X as well as the matching trade should be deleted. Or whether this transaction has no match and should simply be deleted. Or whether this is a corrections trade and should be imported as a valid buy or sell. If so you should change the X in the open/close column to an O or C.
Or whether this is a valid sale transaction where the price is so low that the commission causes the amount to be negative rather than positive. If so you should change the X in the open/close column to an O or C.
PLEASE NOTE: We have found no other way to deal with these. Please complain to TD Ameritrade to look into this and make their trade history report more user-friendly!